Tamale, Ghana – May 13, 2013–The $2.4-million CIDA-funded Climate Change Adaptation in Northern Ghana Enhanced (CHANGE) Project has started strong with communities organizing, being trained, and selecting sites for climate-smart agricultural endeavours to commence. 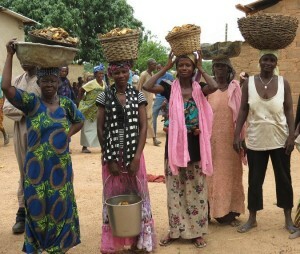 A joint effort made possible through the generous funding of the Canadian International Development Agency (CIDA) and CFTC’s Canadian partner, Farm Radio International, CHANGE will support 750,000 women and men farmers in 17 communities in the vulnerable Northern, Upper East and Upper West Regions of Ghana. The community-based approach is expected to increase farm yields and income, reducing the impact of climate change, particularly severe for women who are responsible for maintaining and feeding the household but often lack the means to do so. A CHANGE community information session. 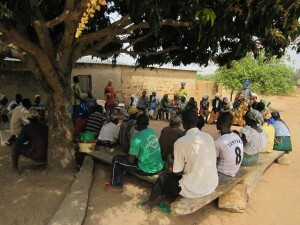 Project Manager Ellen Woodley (in red, at front of group) is speaking to a group of farmers and tree nursery operators in Dangi, Upper West Region, Ghana. The project is being implemented locally by CFTC’s two long-time partners, Regional Advisory and Information Network Services (RAINS) and TradeAID Integrated (TAI), and one newer one: Tumu Deanery Rural Integrated Development Program (TUDRIDEP). Each partner will deliver a specific set of sustainable agricultural and non-agricultural livelihoods programs, knit together by an agricultural training program designed on a “train-the-trainer” basis. Technical experts from SARI (Savanna Agricultural Research Institute) will train Ghana’s Ministry of Food and Agriculture (MOFA) agricultural extension workers as well as community extension workers, who will then deliver and support climate-smart agricultural practices and technologies to farm-based organizations and groups of women and men farmers throughout Northern Ghana. Executive Director Debra Kerby (third on left) and her travelling companion, CFTC Board member Derek Briffett, his wife Darragh and their daughter Michelle, meet the staff at Radio for Development. 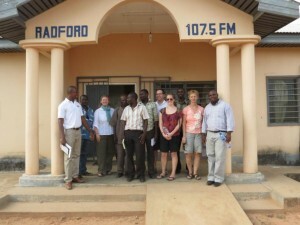 The scope and reach of CHANGE is further expanded by radio programming that will be broadcast throughout Northern Ghana by Radio for Development (RADFORD), which has delivered similar successful initiatives, including one that helped increase literacy rates in the region from 12 to 26 per cent. RADFORD will provide “just-in-time” weather forecasts and recommendations for crop planting from SARI and MOFA to small-scale farmers who are currently experiencing serious declines in crop yields as a result of the unpredictability of the rains, among other factors. The women of Zoosali in Northern Region are spearheading phase two of the Climate Seeds Knowledge (CSK) initiative. The project – which launched in a pilot phase and is being expanded as part of CHANGE – is aimed at enhancing climate resilience for women farmers in the Northern Region of Ghana through the revival of traditional seed diversity and knowledge. 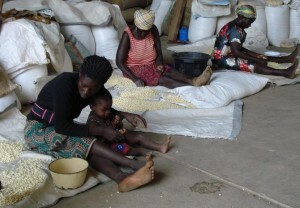 Women sorting seeds as part of the Climate Seeds Knowledge component of the CHANGE Project. According to Ellen Woodley, CHANGE Project Manager who presented the results of phase one to 30 climate change experts at an event hosted by CFTC in Toronto in March, there are high expectations for the second phase. “Phase one clearly achieved greater sensitization and awareness of climate change among program participants, and increased dietary diversity, household food security and improved nutrition for beneficiaries,” said Ellen. “Importantly, nearly-extinct indigenous seed varieties (e.g., bambara beans, cowpea, sesame, melon and late millet) have been revived, primarily through seed exchanges among women’s groups in project communities,” she added. The newfound role and respect for women’s expertise has broadened community support for women-led farming activities such as land preparation, and enhanced their status as custodians of indigenous seeds and traditional knowledge in the participating communities. In phase two, this has made the acquisition of land for women easier. RAINS is helping the women farmers working on the CSK initiative acquire land through family heads, elders and beneficiaries’ husbands: one acre per every two farmers in five communities. The phase two CSK group consists of 24 women and eight men in each community, who are now selecting the indigenous seed varieties that they will plant. The most common crops are bambara beans and a creeping bean plant called “sandzii” in the local dialect. Yellow maize is also popular. Group ploughing – in which an organized group of farmers plough each communities’ fields with hoes (usually not animal traction and never mechanical – which is very hard on the already-depleted soil) – has begun. “Over the next 15 years, the impact of climate change in Ghana is expected to drive temperatures up by 1.7 to 2.0 degrees Celsius with the variability in rainfall patterns becoming much greater,” explained Ellen. “The impact on already dry land and depleted soils is staggering, and therefore the choice of how to plough is critical to preserve what little moisture remains. Animal traction is an acceptable compromise: it reduces the labour (and human energy) involved in hand-ploughing, but it doesn’t go as deep as tractors do, therefore it leaves the moist and nutrient-laden organic layer intact,” she said. Community briefing under a mango tree. Both Ellen and Debra have observed that the communities are greatly concerned and are not hesitating to share that concern – and their frustration – about the serious problems that climate change is posing. “We heard poignant stories from every community we visited. Village elders spoke of their confusion about when to plant with the weather changing so much. They used to know exactly what to plant with each of the rains in a season, but not anymore. They said they were confused by what the Ministry of Food and Agriculture has told them versus what different NGOs have advised. The good news is they do seem happy that the CHANGE Project is bringing all of these different players together to address something so significant in a more focused way,” said Debra. 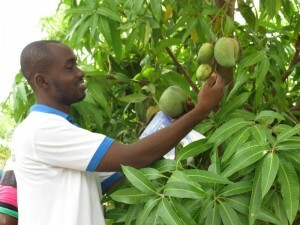 Grafted mangoes are much larger than the native mangoes on the trees, and bring a higher price in the market. The process offers new opportunities to more members of the community. One example of the innovation and excitement about the new options becoming available is evident in the small community of Dangi in Ghana’s Upper West Region. Issifu, a farmer who began growing mangoes on his two acres of land 10 years ago and now has dozens of trees, uses a specialized process of grafting mango seedlings onto his existing trees, yielding a much larger – and higher value – mango from the same trees that used to grow smaller ones. Up until now, the women of Dangi have pursued traditional farming and income generation work selling dawa dawa (spice), pottery, shea nut and charcoal – but it is not enough to sustain them or their families. The process of cultivating and growing the mango seedlings, to grafting the seedlings onto grown trees and later harvesting and selling them, involves the entire community and offers women a new option for agricultural income by meeting the growing demand for mango seedlings. The women of Dangi will also grow cashew and moringa seedlings for sale this year. The Dangi women display their mango seeds, from which they will grow seedlings for grafting. 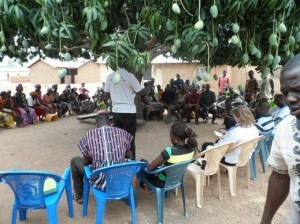 Debra met with Dangi community members during a community meeting held under a huge mango tree. Amidst this bounty, the conversation focused on the impact of the changing timing of the rain and increasing temperature. Both men and women seemed keen to learn more about climate change through the CHANGE Project training with the support of technical advisors and newly-trained local agricultural extension agents who will be better able to help the community plan more effectively around planting and crop cultivation. Following the meeting, the women proudly displayed the mango seeds they have been carefully storing which will be used to grow the seedlings. Walking down to an enclosure surrounded by excited children, the women pointed out the spot under a large shady tree where the seedlings will be cultivated and then grafted prior to sale. “The high level of care and commitment the community has already made to this project was very evident. It is very inspiring to see the time and care it takes to bring this new approach to life – and the creativity that lies within the community to strengthen their livelihoods in new ways. Very inspiring!” said Debra.